Pay For Winning Bids Here! Thank You! Your winning bid is a donation to our organization! to benefit Freeway's Greyt Escape, Inc. , a nonprofit organization helping retired greyhounds! Online Bidding Only by commenting with your highest bid. You MUST comment in the comment section for the PHOTO of the item you are bidding on. Bids only accepted between Feb 11 8am EST - Feb 16th until 6pm EST. RULES - Please Read Before Bidding! All bidders must register before bidding. Bidding can only occur during the LIVE Auction (Feb 11- Feb 16). Unless otherwise stated, bidding will increase by $2.00 increments (whole dollar amounts, no change). Actual postage for shipping costs are the responsibility of the winning bidder, unless otherwise stated on bidding item (such as local pickup). Winning bidders will be notified immediately of their winning bid. Postage will then be calculated based on shipping address, and a total cost for the auction item WITH actual shipping cost will then be provided to the winning bidder. Auctioneer will, at their discretion, determine most economical shipping rates, to include insurance and tracking. Winning bidder shall have until Saturday, Feb 17th, 2018 at 10:00 PM to make FULL PAYMENT to auctioneer, via our PAYPAL (no paypal account required to pay through our PayPal portal. All credit/debit cards are accepted). In the event winning bidder fails to pay in timely manner, the Auctioneer will immediately offer that item to the next highest bidder, by way of default. That buyer has until Sunday Feb 18, 2018 by Noon to make full payment. Your highest-bid comment left on the item is considered your OFFICIAL BID and is a binding bid and intent to pay for the item if you win. Should an item arrive broken or damaged, the winning bidder may file a claim with the postal carrier. In the event the item is lost in the mail, auctioneer will use tracking information to determine location of the parcel and proceed in accordance with postal carrier's instructions. 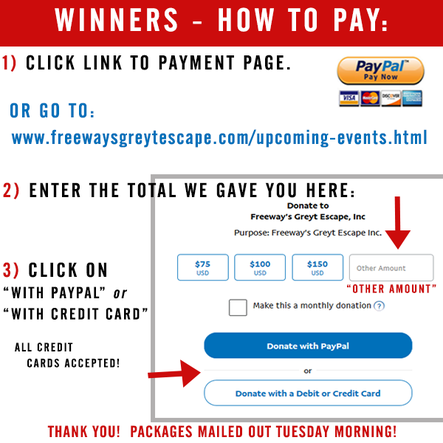 Winning bidder holds Freeway's Greyt Escape, Inc., it's officers, directors, volunteers, harmless for any damage, destruction or loss of property. 100% of the proceeds from this auction with be used to help injured (surrendered) greyhounds by providing financial assistance for emergency medical expenses for injuries sustained racing their last race. Freeway's volunteers have used resources to the best of their ability to determine the authenticity of an item and describe each item in the auction as accurately as possible. Please contact Diana for additional information on a particular item you may be interested in acquiring. Multiple items one address may be combined for more economical postage.